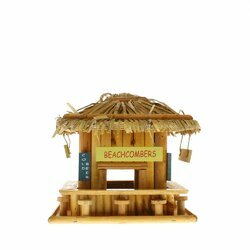 Beachcombing birdies will belly up to this adorable wood snack shack! Just like a favorite seaside hangout, this birdhouse is complete with straw roof and barstool perches. Weight	2 pounds. 8.25" x 8.25" x 7.75". Eucalyptus Wood, Plywood. UPC Number:849179006617.